Ivermectin: does P-glycoprotein play a role in neurotoxicity? The macrocyclic lactone ivermectin (Mectizan®) is widely used for the control of human filarial infections, particularly as a donated product for onchocerciasis and lymphatic filariasis. In the case of control of lymphatic filariasis in Africa, it is used in combination with donated albendazole. In areas co-endemic for Onchocerciasis and Loa loa, serious adverse reactions have been observed in patients with apparently high microfilaria counts of Loa loa. Recent findings suggest that the severe central nervous system side effects seen in various vertebrates following ivermectin treatment may be due to an absence of, or functional deficiency in P-glycoprotein. P-glycoprotein is expressed in the apical membrane of brain capillary epithelial cells and is responsible for limiting the brain penetration of a range of compounds. Toxicity of ivermectin in some collie dogs may be explained by a 4-bp deletion mutation of the mdr1 gene resulting in a frame shift, generating stop codons that prematurely terminate synthesis of P-glycoprotein. Additionally, sub-populations of CF-1 identified as expressing reduced levels of P-glycoprotein exhibit increased toxicity to substrates of this transporter. Furthermore, while the traditional view of drug-drug interactions is alteration in drug clearance mediated through a change in hepatic drug metabolism, some of these changes may arise through competition for binding sites on P-glycoprotein in the blood-brain barrier, resulting in reduced extracellular efflux and enhanced CNS toxicity. In conclusion, P-glycoprotein is an integral component of the human blood brain barrier and plays a central role in limiting drug uptake into the brain. Altered expression or function of p-glycoprotein could conceivably allow elevation of brain concentrations of ivermectin and produce severe neurotoxicity. This might arise through a genetic polymorphism in p-glycoprotein or co-administration of ivermectin with a drug or foodstuff that might inhibit this efflux transporter. Although clinical and veterinary usage of the broad-spectrum anthelmintic agent ivermectin has generally been free of serious adverse events since 1991, a number of clinical cases with and without neurological manifestations, including coma lasting 2–3 days, have been reported after ivermectin treatment of individuals infected with Onchocerca volvulus who also had concomitant Loa loa infection with a high levels of microfilariae, typically > 30,000 microfilariae /ml of blood [1, 2]. Although a cause and effect relationship has yet to be established, it is advised that individuals who warrant treatment with ivermectin for any reason and have had significant exposure to Loa loa-endemic areas of West and Central Africa, pre-treatment assessment for loaiasis and careful post-treatment follow-up should be implemented. The aim of this brief review is to assess whether any of these events could be attributed to the pharmacology of ivermectin, notably its affinity for the P-glycoprotein drug transporter, which might serve to reduce oral bioavailability of ivermectin and prevent its uptake into the brain, thereby preventing potentially fatal neurotoxicity. The macrocyclic lactones comprise the avermectins (e.g. 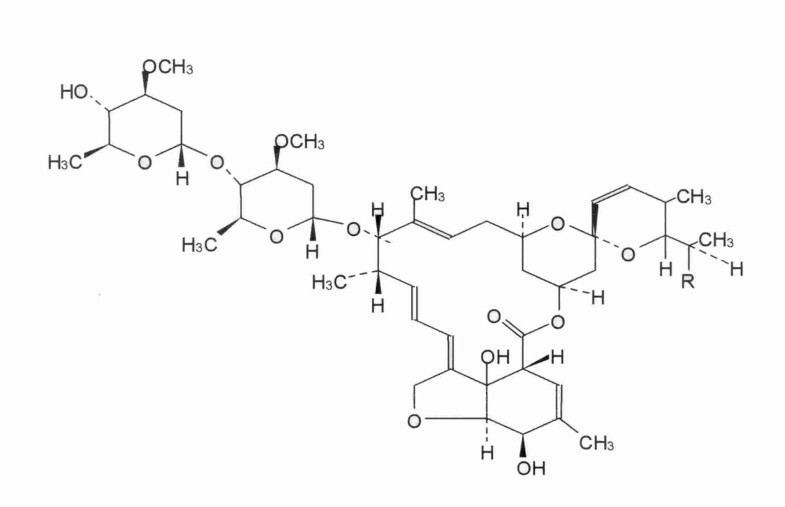 doramectin and ivermectin; [Figure 1]) and the milbemycins (e.g. moxidectin). They are natural fermentation products of Streptomycetes bacteria. Many have potent anthelmintic and insecticidal properties [3, 4] and are drugs of choice for nematode infections in animals. Ivermectin is the preferred treatment for onchocerciasis and other human filarial infections, such as Wuchereria bancrofti. Macrocyclic lactones produce a flaccid paralysis of the somatic worm musculature and inhibit feeding of the parasite through blockade of pharyngeal pumping [5–7], suggesting that a disruption of ingestion is the primary action of these agents  However, the somatic musculature is also understood to be a target and may explain the reduction in release of uterine microfilariae seen after exposure to ivermectin. Molecular genetics with C elegans and expressed receptors has shown that macrocyclic lactones act as agonists of a family of invertebrate-specific inhibitory chloride channels that are activated by glutamic acid [8–11] and related phylogenetically to vertebrate GABAA gated chloride channels . While the selective effect of ivermectin can be explained by its action on the glutamate-gated chloride channels unique to invertebrates, at higher concentrations ivermectin can also potentiate vertebrate GABAA gated chloride channels. This has led to suggestions that ivermectin and related drugs may be toxic in vertebrates having a deficiency in their blood brain barrier . Recent findings suggest that the severe central nervous system side effects seen in various vertebrates following ivermectin treatment may be due to an absence of, or functional deficiency of P-glycoprotein . Chemical structure of ivermectin. Ivermectin contains not less than 93.0% of 22,23 dihydroavermectin B1a (R = CH3) and the sum of B1a and B1b (R = C2H5) is not less than 97.0%. B1a, and not less than 97.0% of 22,23-dihydroavermectin B1 (B1a + B1b). The blood brain barrier is comprised of brain capillary endothelial cells linked by tight junctions that form a lipophilic physical barrier that limits the passive transport of substances into the brain. While the permeability of the blood brain barrier increases with increasing lipophilicity, several transport proteins have been identified that regulate the penetration of many poorly lipophilic compounds. Conversely, many highly lipophilic substances such as cyclosporin and ivermectin show unexpectedly poor penetration of the blood brain barrier. It is now believed that this phenomenon is a result of the actions of drug efflux transporters [15, 16]. Although molecular characterisation of those transport proteins present in the apical and basolateral membrane of brain capillary epithelial cells has identified a range of drug transporters such as MDR, MRP and OATP [17–20], it is p-glycoprotein that has been most widely studied. P-glycoprotein is expressed in the apical membrane of brain capillary epithelial cells and is orientated to pump noxious substrates from inside cells and back into the blood (Figure 2). P-glycoprotein is responsible for limiting the brain penetration of a range of compounds of different therapeutic classes and in some cases may influence decisions regarding the clinical usage of such agents. For example, the anti-diarrhoeal opiate loperamide is safe and effective peripherally but does not act centrally since brain penetration is minimised through the actions of p-glycoprotein. However, it must be conceded that an accurate assessment of the role of p-glycoprotein in the function of the human blood brain barrier is limited by our inability to measure readily drug concentrations in the brain. Furthermore, altered distribution within the brain may not always show itself as a change in circulating plasma concentrations. . A pharmacodynamic indicator would be necessary to determine whether there was any exacerbation of centrally mediated effects brought about through genetic polymorphism in mdr1 [21, 22] or inhibition of p-glycoprotein function. Simplified cartoon of P-glycoprotein structure and function: The P-glycoprotein molecule spans the cell membrane and in this way is in contact not only with the membrane but also the inside and the outside of the cell. The central portion of the molecule is a channel or pore through which toxic chemicals are pumped back out into the environment. The toxic chemicals can enter the transport pore either from the interior of the cell or from its membrane as shown. 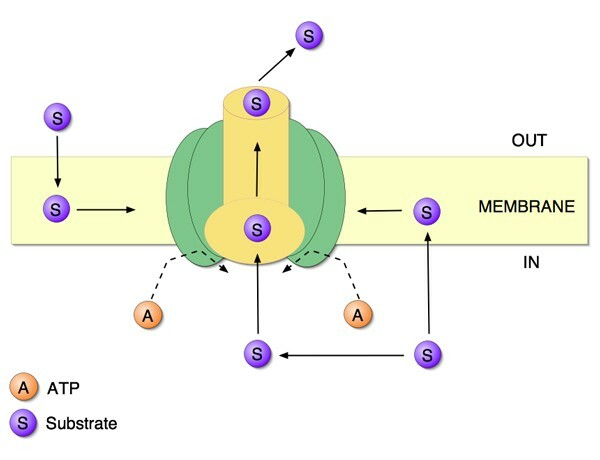 Molecules of ATP power the pumping action. The principal toxicological effects of ivermectin seen in rats are ataxia, ptosis and decreased activity, and in dogs are mydriasis, tremors, ataxia and anorexia  with enhanced sensitivity in infant rats that have a poorly developed blood brain barrier (with regard to their deficiency in p-glycoprotein), and show higher brain plasma drug concentration ratios than adult rats. During the development of Mectizan® two reports, one from the veterinary use of ivermectin and another from a pre-clinical toxicology study, influenced the clinical development of Mectizan® such that a more conservative approach was taken . First, it was noticed that a sub-population of collie dogs was remarkably sensitive to ivermectin-induced neurotoxicity . This occurs at doses that are 1/200th of the dose required to cause toxicity in other dogs. Neurological manifestations of ivermectin in susceptible dogs include, hypersalivation, ataxia, blindness, coma, respiratory compromise, and death. It is now known that such ivermectin-sensitive collies exhibit a 4-bp deletion mutation of the mdr1 gene that results in a frame shift, generating several stop codons that prematurely terminate synthesis of P-glycoprotein. Dogs that are homozygous for the mutation display the ivermectin sensitive phenotype, whereas those homozygous normal or heterozygous show no increased sensitivity to ivermectin . Second, sub populations of CF-1 mice were identified as expressing reduced levels of P-glycoprotein, including a population that does not produce P-glycoprotein, identified as (-/-) . Animals with the wild type (+/+) or deficient genotypes differ markedly in their sensitivity to ivermectin neurotoxicity and teratology, attributable to differential accumulation of ivermectin in brain and foetus. CF1 p-glycoprotein deficient mice are phenoptypically identical to mdr1a and mdr1b knockout strains established in the laboratory . Using such strains, differences in pharmacokinetics and tissue distribution, particularly accumulation in the brain, of several substances can be demonstrated when compared with p-glycoprotein wild type mice [29, 30]. These authors clearly established the mdr1a transporter as central to limiting the oral bioavailability and brain uptake of these agents. Studies with ivermectin and the p-glycoprotein substrate cyclosporin A in CF-1 mice demonstrated enhanced absorption of ivermectin and cyclosporin A in the (-/-) strain although there were no differences in the intravenous pharmacokinetics of either drug. Hepatic drug metabolising capacity of (-/-) and (+/+) animals was similar. Concentrations of [3H]-ivermectin and [3H]-cyclosporin A were always higher in the brains of (-/-) mice after oral or intravenous administration but liver concentrations were identical to wild-type mice. These findings clearly demonstrate that changes in ivermectin disposition observed in the (-/-) mice arise through a deficiency in p-glycoprotein rather than any alteration in drug metabolism . Drug-drug interactions of clinical importance can occur when the pharmacology of a drug is altered by co-administration of another agent. The question of drug-drug interactions among anthelmintics is yet to be answered satisfactorily. This is an important issue, since combination chemotherapy is becoming more widespread as resistance to antiparasitic agents increases. For example albendazole and ivermectin are co-administered in programmes to eliminate lymphatic filariasis . Experiments in human liver microsomes and recombinant enzyme systems have shown that ivermectin and albendazole are both substrates of cytochrome P450 (CYP) 3A4, the most widely distributed human P-450, which is expressed both in the liver and small intestine [32, 33]. We have shown that albendazole is converted to albendazole sulphoxide, the major plasma metabolite in man, by microsomes prepared from human intestinal tissue . There is, therefore, the potential for drug-drug interactions at each of these sites through competition for drug metabolising enzymes. The traditional view is that drug-drug interactions are a result of alterations in drug clearance mediated through a change in hepatic drug metabolism. However, it is becoming clear that some of these changes may arise through competition for binding sites on transport proteins. Fluorescent-labelled ivermectin (BODIPY-ivermectin) is extruded out of brain capillaries by a concentrative mechanism and this export process is reduced by substrates of p-glycoprotein without any change in drug uptake . Moreover, transport of BODIPY-ivermectin is restricted to p-glycoprotein, as it is unaffected by specific inhibitors of related transport proteins and it interacts specifically with p-glycoprotein in functional kidney tubules . These findings suggest that other P-glycoprotein substrates could compete with ivermectin at this site, resulting in reduced extracellular efflux and enhanced CNS toxicity. Such compounds include cyclosporin and HIV protease inhibitors [37, 38]. Increased ivermectin concentrations accompanied by enhanced neurotoxicity of ivermectin in mice has already been demonstrated in the presence of cyclosporin . While an interaction between ivermectin and albendazole could be postulated on the basis of these drugs being co substrates of CY3A4, it is not established that there could be an interaction at the level of p-glycoprotein. Although ivermectin is undeniably a substrate for P-glycoprotein, there is conflicting evidence for albendazole. Intestinal metabolism and secretion of albendazole sulphoxide into the intestinal lumen has been demonstrated and p-glycoprotein is reported to be involved in modulating resistance to albendazole in helminths [40, 41]. However, experiments in Caco-2 cells failed to identify albendazole as a p-glycoprotein substrate or an inhibitor of p-glycoprotein mediated transport of digoxin , suggesting that a combination of the two drugs would not produce an adverse drug reaction based upon an interaction with p-glycoprotein. Albendazole sulphoxide or sulphone were not investigated. P-glycoprotein is an integral component of the human blood brain barrier and plays a central role in limiting drug uptake into the brain. Altered expression or function of p-glycoprotein could conceivably allow elevation of brain concentrations of ivermectin and produce severe neurotoxicity. This might arise through a genetic polymorphism in p-glycoprotein or co-administration of ivermectin with a drug or foodstuff that might inhibit this efflux transporter. There are relatively few examples of clinically important drug-drug interactions at the blood-brain barrier that involve increased drug exposure within the brain. As mentioned previously, alterations in uptake into the brain may not be manifest as a change in systemic pharmacokinetics and may only become apparent when a pharmacodynamic assessment is made . Furthermore, it may not be possible, with therapeutic doses, to achieve sufficiently high concentrations of a co-substrate to allow a drug-drug interaction to take place. For example, a range of antipsychotic, antiemetic and Ca2+ blocking agents failed to produce effective inhibition of p-glycoprotein despite the achievement of suitable concentrations within the systemic circulation . Perhaps more importantly, it should be remembered that clinical and laboratory findings suggest that Mectizan®-associated L. loa encephalopathy is consistent with an embolic process triggered by massive microfilarial death. It may also involve circulating immune complexes or polymorphic inflammatory responses. Moreover, serious or even fatal encephalopathy may develop spontaneously, or following treatment with other microfilaricides such as diethylcarbamazine . It is therefore questionable whether any of the neurological sequelae associated with administration of ivermectin are directly related to the drug and therefore it seems unlikely that any alterations in the pharmacokinetics of ivermectin for whatever reason would result in a more severe adverse reaction. Geoffrey Edwards was sole author. Original work referred to by the author (references 32 and 34) was supported by a postgraduate studentship from GlaxoSmithKline Pharmaceuticals to Dr Helen Rawden.